Ever since leaving MD I have been fighting a cold and Thursday (yesterday) I was not wanting to do anything. Frustrated in not doing any work on the camper I just figured since I am retired there is always tomorrow. 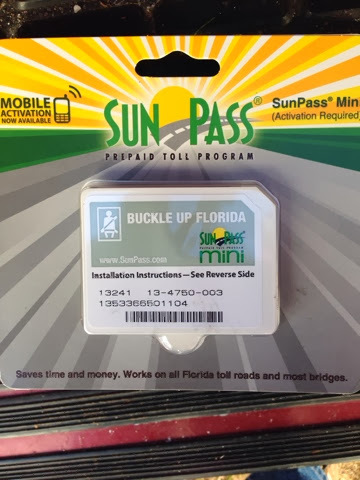 I did accomplish getting a SunPass for the Florida Turnpikes, since Friday I head south to visit cousin Joan. Now I will have to see how this works. I also went for a 4.5 mile walk, but felt so lousy that when I got back I took a nap. Last night I started to feel better and went outside from 9p to 9:20 to watch a rocket launch but didn't see it. I found out this am that it was delayed 40 minutes, and by then I was looking at the back of my eyelids. I haven't even thought of interviewing anyone feeling so lousy and most of my voice was missing. I would have scared people off. I have been thinking about the weather as I was going to go to the FL panhandle in about a week and it is currently too cold there right now for me to want to head there. Here's to sending the artic air mass to Canada.